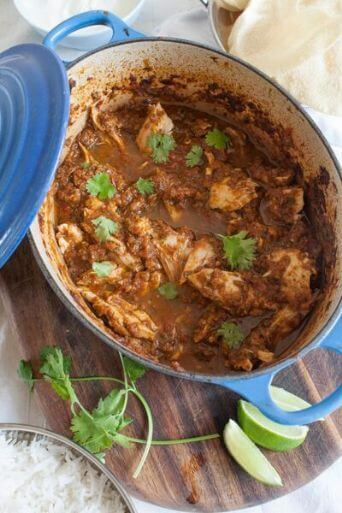 Leftover Cockerel Curry | Packington Free Range | Born and reared outdoors. Always. The beauty of this dish is that you can use Sundays leftover roast cockerel and transform it into something completely different. Also, there is the perk that absolutely nothing will go to waste! This mouthwatering curry is jam packed full of flavour and fresh ingredients to tingle your tastebuds! Pre-heat the oven to 150. Dry fry the spices until gently warmed then pulse/grind to a powder. Blitz together all the paste ingredients until smooth, then add to the dry spice mix. Fry the mixture in the vegetable oil for 5 minutes in a large casserole dish with a tight fitting lid. Place the tinned tomatoes into a bowl and mush together with your hands – removing any tough centres.Season and mix together. Add the tomatoes to the casserole dish and fill the empty tin with water, add this to the dish also. Place in the pre-heated oven or gently simmer on the stove for 1 1/2 – 2 hours or until thickened and darkened in colour. Once the sauce is cooked add the shredded leftover cockerel and cook through. Sprinkle with the chopped coriander and serve with rice and a wedge of lime and natural yoghurt.